The nominations are presented with those made by comments on the blog first, then nominations in the engagement Google group, then emails to me, in the order I received them. We had one nomination for a project pegged to New Year’s Day, but it encountered problems and was withdrawn. If I’ve overlooked a project that was submitted, please alert me and I’ll add it. Because of the holidays, I’ll leave voting open through Monday, Jan. 6 and announce the winner on Tuesday, Jan. 7. Our project is a snowman decorating contest by our staff. Each department in our building received a snowman and the final project was due Dec. 12. On that day, I took a picture of each snowman and posted them into an album on Facebook. 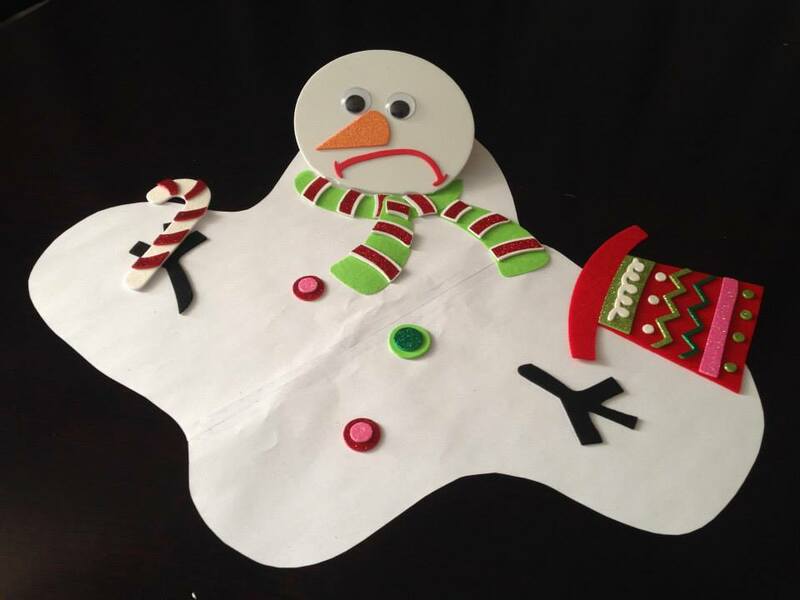 Our readers get to vote for their favorite snowman by “liking” the picture of it. The “voting” will be open for a week, and then we’ll be announcing our winner at our annual holiday party on Dec. 19 and the department that wins gets a pizza party! If you take a look at each photo in the album, you’ll see the likes have gone up since then. You can also see the amount of shares that each photo got. We did this last year with a gingerbread house decorating contest and got great feedback from readers. We were nearly overwhelmed by the audience participation on this project. Within minutes of putting out an online call for people’s memories of JFK’s assassination, we began receiving emails, and the stream of memories didn’t stop for two weeks. We received more than 100 emails, letters and online comments, including from people who showed up in our lobby to hand-deliver their accounts and show us memorabilia. Digital editor Dave Allen spent hours sifting through the responses so that we could post them online as soon as possible — and that in itself generated additional online comments. Other Marin IJ engagement projects were a cookie contest and a #MarinLights Storify project. 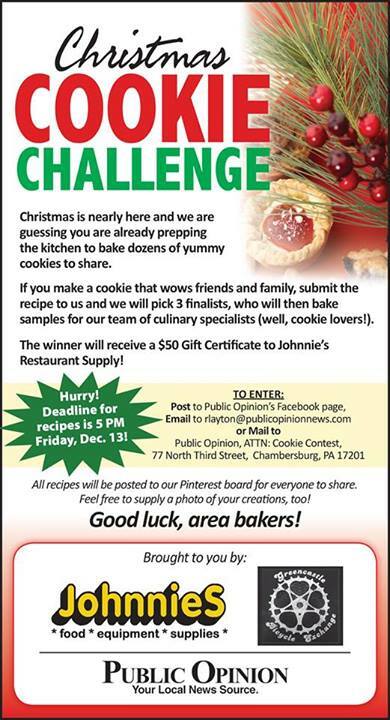 The Chambersburg Public Opinion is holding a Christmas cookie recipe contest, driven through Facebook and promo ads. 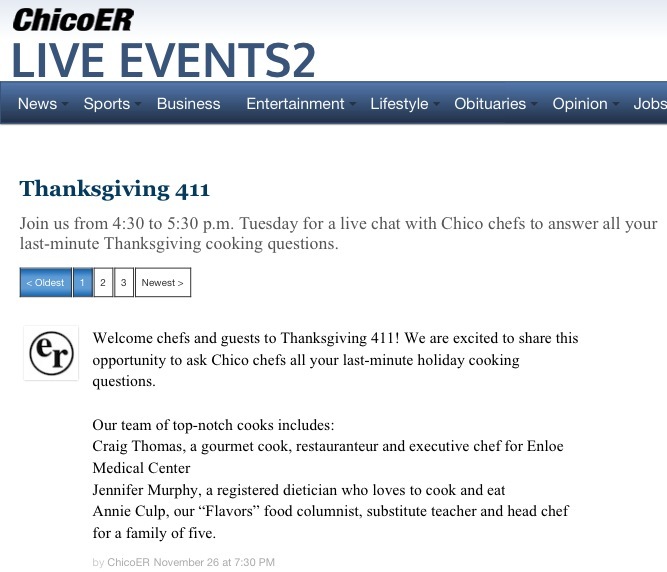 Days before Thanksgiving, the Chico Enterprise-Record sought to engage readers struggling with last-minute holiday cooking questions by hosting an online chat with three Chico chefs. Dubbed “Thanksgiving 411,” the chat took place two days before the holiday feast and lasted one hour, with readers asking impromptu questions ranging from the best way to cook turkey to non-marshmallow yam recipes and healthy-but-delicious vegetable dishes. We used Scribble Live to host the chat. Reporter Ashley Gebb moderated and posted recipes, while readers typed in their name (either real or pen names – creativity points for Gravy Train Conductor, whoever you are) and questions for the chefs to instantly answer. In advance, we promoted the chat extensively in print (in both the food and news sections) and on our website, Facebook, Twitter and even Tout. A breaking news bar at the top of our homepage alerted readers to the chat for 30 minutes before it started and throughout its duration. We published a chat recap the following day with a weblink so readers could go back and read the discussion in its entirety. As for engagement, we had 30 submitted questions, 56 unique visitors, 96 page views, 32.86 average minutes on site and 3,155 engagement minutes – not too shabby for our first attempt. But, the most rewarding measure of success? Our chefs all had a blast and said they would love to participate again! 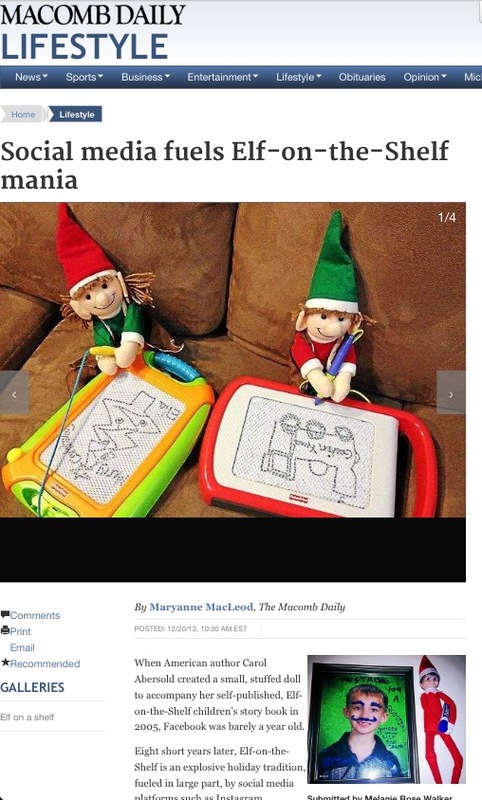 At the Macomb Daily, we hopped aboard the manic Elf-on-the-Shelf train by asking readers to share their personal anecdotes and photos. We were gratified by how warmly they responded. Participants can enter through Dec. 26 and share photos, videos, recipes, etc. of whatever helps get them through these grey winter days. We’ll share submissions online and in print and three winners will receive two First Night buttons (all-access admission). Pottstown has a very rich history and our readers love when we get nostalgic. 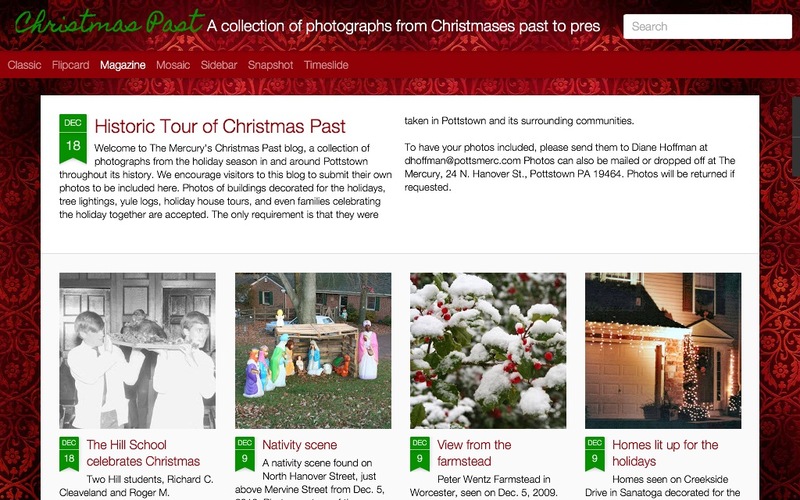 So this season we’ve been collecting old pictures of the holidays in Pottstown. We’ve got pictures going back to the 1940s. We solicited the pictures in a story and post them to a Christmas Past blog. We ran a Christmas holiday drive for the Laurel House Shelter, prompted by our experiences covering violent domestic violence crimes in our coverage area this year. Here is our call for donations. Within three weeks we received $314 in donations, through readers mailing in donations and also through a collection by our winter intern Maggie Wurst and me (Community Engagement Editor) at the Lansdale Train Station during the morning commute (6-9 a.m.) for two days the week before Christmas. Readers donated items to the shelter by dropping items off at our office. They filled two 4 foot high boxes and covered the floor in our lobby. Also, the Souderton High School student newspaper (The Arrowhead) collected items through a student run drive and brought them to our office. We filled Laurel House’s front room when we dropped the items off and got many compliments from our readers thanking us for running the drive. Montgomery Media also chipped in and collected with us. 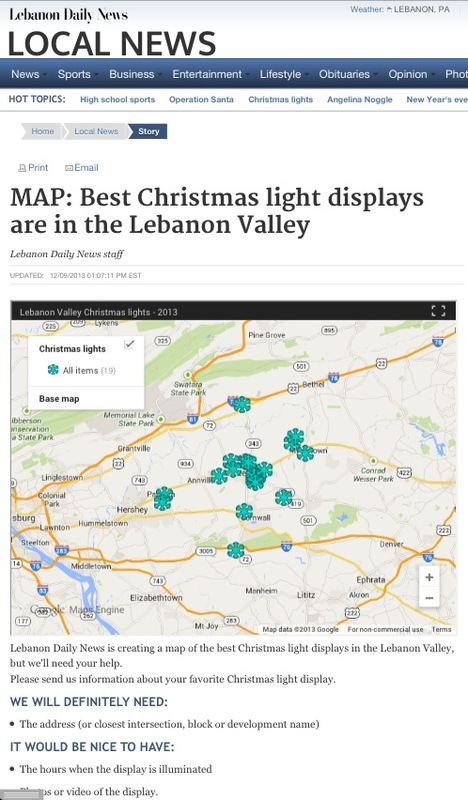 We are doing a roundup of the best Christmas light displays in Lebanon County by asking people to submit addresses/intersections that we add to our map. Other Lebanon Daily News engagement projects are a map of Christmas tree farms or retailers, the annual Operation Santa and a slide show on things people were thankful for. 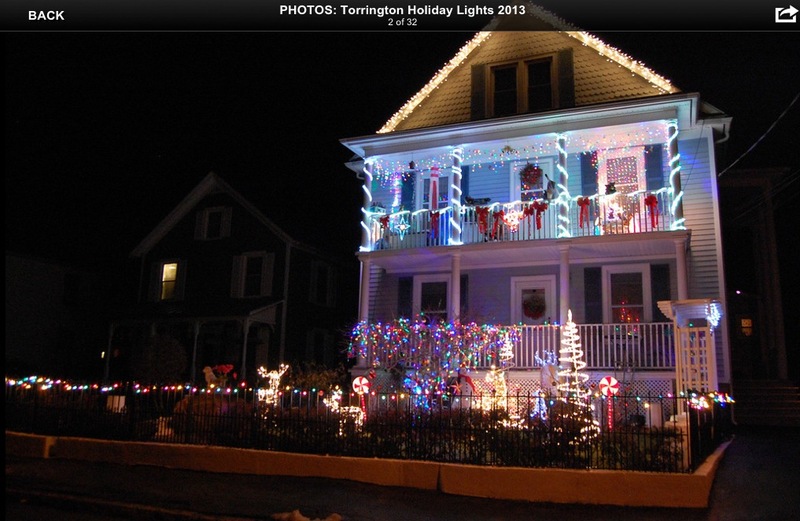 In Torrington, I’m gathering up both staff and submitted photos of holiday lights in the city and mapping as many as we can on a Google map once the photos and addresses start to come in. I’ve created a Media Center gallery to display all the photos, which I’ll highlight on our website, blog, social media and our mobile apps, and also plan on taking a few of the more elaborate displays to Facebook, perhaps by splitting an image showing two houses and asking people to comment if they like the house more and like the post if they’d vote for the other. In Kingston, N.Y. We upgraded our yearly Holiday Lights tour. We solicit entries from our community which we then put together into a drivable interactive map and some of those houses on the route are touted and put into a Storify (we use #DFLights13). We created a QR code to facilitate directions (and for ease of access on mobile devices and tablets AND print)! A Tout video showed how to use the QR code to create an app for your phone. Here’s how it works, and, man, it works. The QR code pulled in 138 scans (and counting! ), I think, because it really was special. I know it doesn’t sound like a lot, but it is for what it is. Our photog made a gallery of nominations. The story, which links to all this content, focuses on some of the homes that stand out. Once published, we used Crowdmap to allow others who missed a chance to get in to add themselves to the tour. And we put it all together in one page, because why not? For the seventh year, The Denver Post is allowing readers to upload photos of their decorated homes to our interactive map where readers can zoom in on their area or take in the whole metro area. The printed map allows readers to see only the area they’ve zoomed in on and up to 10 listings with complete addresses in the visible area so they can determine a route to see the lights. In addition, the map allows readers to look at past years’ listings to find areas that might be worth exploring. Every week in December we choose a winner from among the submitted photos to focus on. Winners get a $25 gift card, and their photo is published in the Saturday Home section in print and online, with a short story about the history of their lighting displays. Here’s an example. 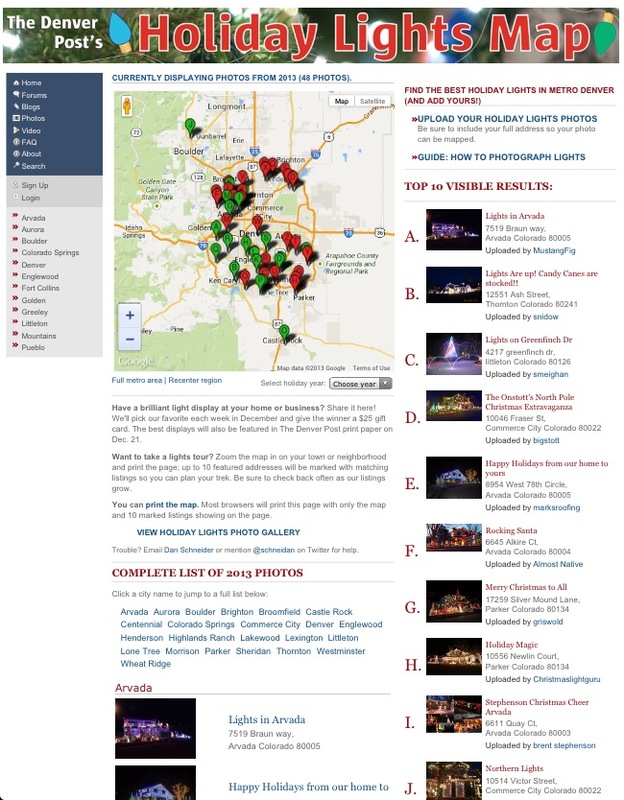 We put together a comprehensive holiday lights package last year. This year, we decided to kick it up a notch, streamline our process and provide even better, more useful information to our readers. Who was involved: Aimee Heckel at the Boulder Daily Camera, Whitney Bryen at the Longmont Times-Call, Jessica Benes with the Loveland Reporter-Herald and Julie Baxter, Megan Quinn and David Jennings with the Broomfield Enterprise worked together as a regional reporting team, in an unprecedented effort to tackle this topic on a grand scale — and save us all lots of time in the meanwhile. What we did: We used a new, free smartphone app, TrackMyTour, to produce a giant regional holiday map with HUNDREDS of points, all photographed and automatically plotted using smartphones onto an embeddable Google Map, thereby removing the need to enlist photographers, web designers and page designers for the first year ever. Talk about a time-saver. You’ve really got to click on this map and zoom out to see the extent of our listings! You won’t believe it. Working with readers: We also solicited reader submissions and photos, which we simply added to our map using latitude/longitude coordinates. We solicited submissions via the web, print, Twitter and social media (including a chat room for a local mom’s group, which proved very helpful). We added comments to many of the photos to provide additional information to readers. But wait. There’s more! 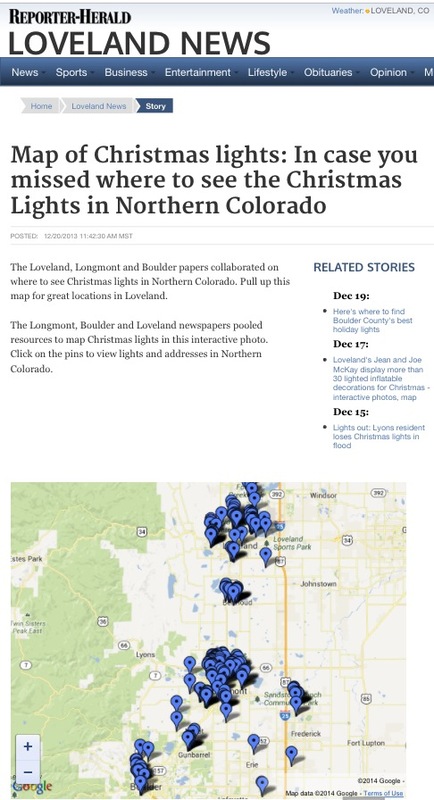 Whitney wrote an excellent, newsy story about a popular local lights display that was destroyed by the Colorado floods. Megan wrote a second narrative about Broomfield’s lights displays. 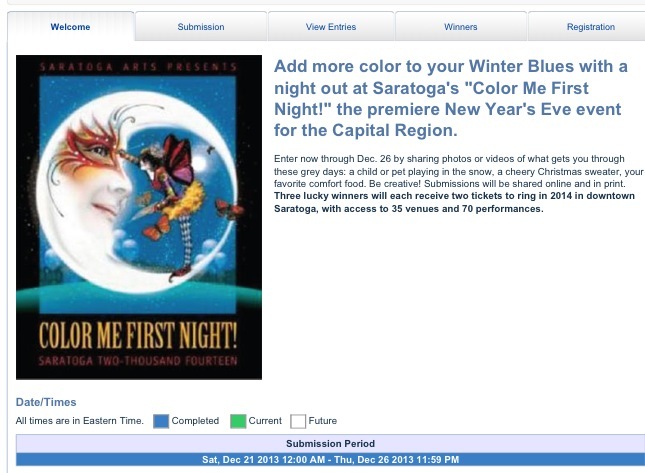 Aimee created an interactive image using Prezi of one of Boulder County’s biggest lights displays. And Jessica created an interactive image of one of Loveland’s great displays using Thinglink. Yes, we used both of our favorite interactive image creators! In addition, photographer Paul Aiken put together a beautiful photo slideshow online. This mega package ran in all four newspapers and was wonderfully received by the community. Check it out on the Camera, Times-Call, Reporter-Herald and Enterprise sites. We experimented with dozens of apps before settling on this one, which was quick, reliable, automated and easy to use. The app we used last year did not create an automated Google Map; we had to plot the houses manually on Google Maps, which took hours. This year, all we had to do was click and embed. Obviously, the regional listing provided a better service to readers who wanted to make a big night out of viewing lights. In fact, one reader emailed me to say she and her family rented a limo, made hot chocolate and drove up and down the Front Range following this map! Although this package is much more comprehensive than anything we’ve ever created in the past, it was much LESS work for each individual reporter because we worked smartly and because we worked TOGETHER. This was a major lesson for us, and it sets a precedent for years to come. I’m so proud of my team. Please remember to go up to the top of the post and vote for your favorite. Go Colorado Front Range lights!